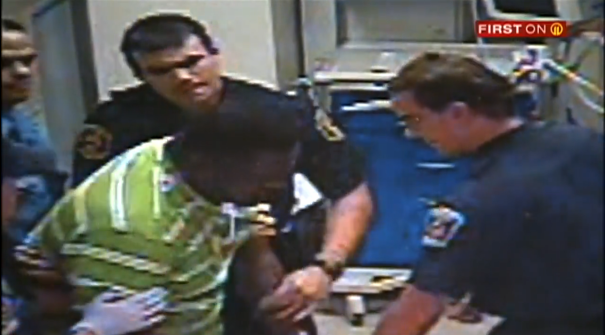 Pittsburgh police ER Taser video: Earl Baldwin Jr. shocked in ER. Earl Baldwin Jr., at left. The hospital says that Earl Baldwin Jr. was interfering with attempts to revive his stepson, Mileek Grissom, during the 2012 incident. Baldwin’s lawyer says medical personnel were not treating Grissom when Baldwin was Tased and that Grissom had already died. In the footage, Grissom’s body is covered by a white sheet. Update, September 26, 2014: Headlines on this post originally stated that Grissom was dying when Baldwin was Tased. Grissom’s state when the incident occurred is in dispute.